Dr. Baraf is the senior member and managing partner of Arthritis and Rheumatism Associates, the country’s largest private practice rheumatology group. He is a Clinical Professor of Medicine at The George Washington University School of Medicine and a Clinical Associate Professor of Medicine at the University of Maryland School of Medicine. He joined ARA in 1978. Dr. Baraf is a Fellow of the American College of Physicians and a Master of the American College of Rheumatology (ACR), the specialty organization for rheumatologists. In 2014 he was honored by the ACR with the Paulding Phelps Award for his contributions to patient care, rheumatology and the practice of medicine. In 1982 Dr. Baraf founded The Center for Rheumatology and Bone Research, ARA’s research division and has served as a principal investigator on over 350 clinical trials studying new treatments for more than a dozen rheumatic disorders including gout, rheumatoid arthritis, systemic lupus, Sjögren’s syndrome, osteoporosis, psoriatic arthritis and osteoarthritis. Dr. Baraf has served on numerous committees of the ACR contributing to programming for its annual meeting, helping to develop quality of care measures for rheumatology and more recently lobbying Congress for more rational systems of patient care. His efforts were instrumental in the ACR’s development of freestanding musculoskeletal ultrasound courses for rheumatologists. As a function of his work in clinical research, Dr. Baraf has co-authored several publications concerning therapeutics in rheumatology. He has presented his work on gout, rheumatoid arthritis, osteoarthritis, ankylosing spondylitis and the safety of anti-inflammatory medications at national and international meetings. He lectures widely on the manifestations of and treatment for the rheumatic diseases. A nationally recognized authority on issues of rheumatology practice management, Dr. Baraf has lectured throughout the United States on topics of practical importance to practicing rheumatologists. He has been invited by the ACR and by the Coalition of State Rheumatology Societies (CSRO) to present workshops and lectures on clinical practice for graduating rheumatology fellows for several years. Dr. Baraf received his B.S. degree at the University of Michigan in Ann Arbor and his medical degree at S.U.N.Y., College of Medicine, Downstate Medical Center, Brooklyn, NY. 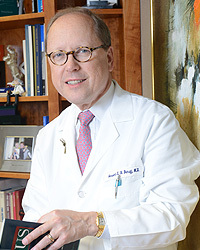 He completed his Internal Medicine training at The George Washington University Hospital, Washington, DC and his Fellowship in Rheumatology at Duke University Medical Center, Durham, NC. He is Board Certified in Internal Medicine and Rheumatology. Dr. Baraf has been recognized as an outstanding specialist in the field of Rheumatology in Washingtonian Magazine, Washington Consumers’ Checkbook, and Best Doctors in America. Accepting patients at our Wheaton facility. “Doctor Baraf was very thorough, explored all possible angles at trying to diagnose my mother’s condition. He consulted with another physician during the visit and made recommendations.” ~ Zenona C.